Sterlco® (Models FT-94 and FT-94HC) Float & Thermostatic Traps are applicable to all types of steam heating systems and steam process equipment that produce exceptionally large amounts of condensate. These traps operate efficiently for low, medium & high pressure applications. Their purpose is to discharge air and condensate while preventing steam from entering the return piping. These traps are manufactured in two sizes (1-1/2” and 2”) for handling capacities of 425 to 24,000 lbs. of condensate per hour. Four (4) possible connections allow greater flexibility in piping. Heavy duty construction throughout. 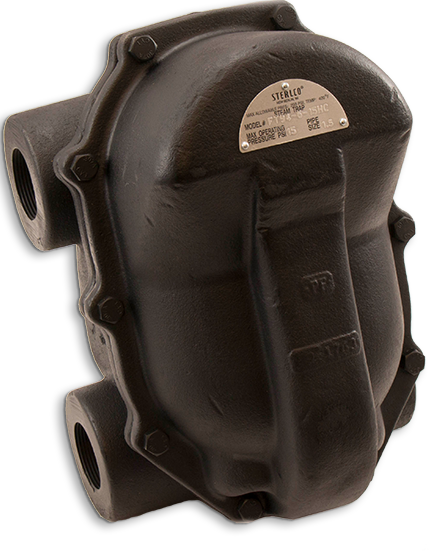 Body and cover are rugged cast iron; all working parts are made of non-corrosive metals especially adapted for this service. Continuous rapid flow of condensate. A lever operated discharge valve opens wide so that large volumes of condensate can flow continuously from trap. Increased full flooded condensate capacity with quick and positive action is assured by the float mechanism’s double fulcrum design. Minimum maintenance. All working parts may be inspected, removed or repaired without disturbing piping connections. Clean-out plug at bottom of trap body permits easy flushing. Why Choose FT-94/FT-94HC Float and Thermostatic Steam Trap?